Even a heavy downpour could not dampen the mood at the 24th annual Taste of Tribeca. As foodies took shelter beneath a sea of umbrellas and loading dock canopies, organizers on Saturday marveled at both the surprisingly healthy attendance and the buoyant feeling of the event. 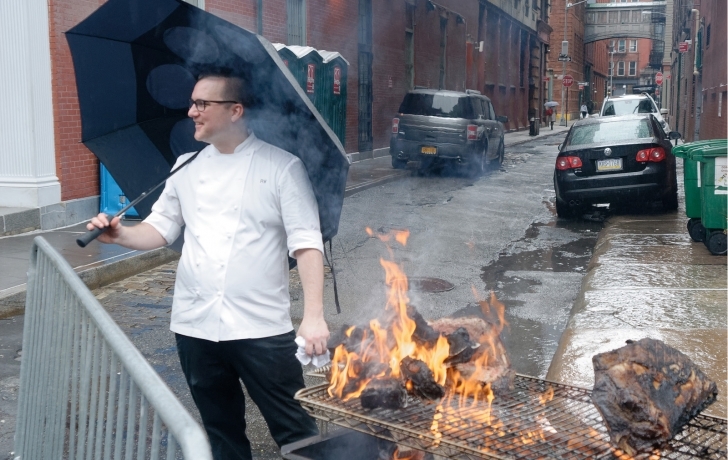 As scheduled, all 63 restaurateurs were still on hand to dish out their tastes, staying mostly dry beneath tents on Duane and Greenwich Streets. And not one of the event’s 40 organizers backed out, organizers said. In 24 years, this is only the second time that rain has fallen throughout the afternoon, and this one was real a soaker. But there was still entertainment from the stage, organized by City Winery, Manhattan Youth carried on with its Sports Zone, and there was craft making in the Kids’ Zone in Duane Park. Then, for real shelter, people could gather in local establishments for the beer, wine and cider tour. The event, as always, is a fundraiser for Tribeca schools PS 234 and PS 150. Undaunted by the rain and smiling broadly as she surveyed the festivities, PS 234 Principal Lisa Ripperger noted the importance of parent engagement in the success of public schools.